Valiant Wings Publishing Airframe Albums are the books that help a modeler when dealing with a specific subject, especially if that subject is "smaller" than what would warrant the full "Airframe & Miniature" (A&M) treatment. There is still plenty to keep a modeler satiated, though: data from spare parts catalogs and flight manuals, period diagrams, walkaround images of the actual aircraft if it still exists, etc. It's just that the subjects dealt with in Airframe Albums either don't have the production run to warrant an A&M publication or there isn't a lot of information on the type still in existance. 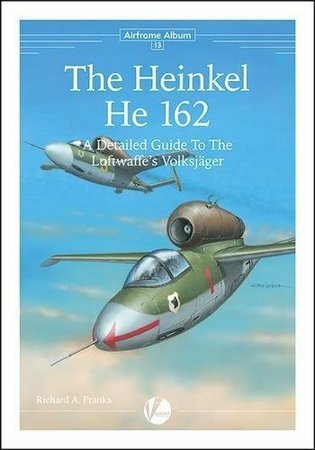 This is definitely the case with the Heinkel He 162. Since this was a project that saw its existence close to the end of World War 2 production really never ramped up and there were only, approximately 320 built and only a few flew in combat. The only model built is the only model that is still in production and not 25 years or older, the Tamiya 1/48 He 162. Steve A. Evans does a fantastic job on the build and most 1/48 modelers will be pleased with his article. Even so, eventually, as 1/144 scale has taken off in popularity and 1/144 models are coming out in force, it would be nice for Valiant Wings to actually provide an article on building a 1/144 model. The Brengun 1/144 He 162 is a really nice kit. If you are a modeler and was hoping for color plates, this title will not disappoint at all as Richard J. Caruana provides plenty of color plates and modeling inspiration. I definitely thank Valiant Wings Publishing for sending this title to review.